Many sign language songs can be used to work toward the same goals as well! At the beginning of the video I also discussed why I don’t call our video ASL & Music, and the short answer is… because what I am doing is not ASL. ASL is a language in and of itself. It has specific sentence structure which does not usually align with the english language. And because my clients goals are often focused around increasing speech and vocalization in the english language I want to use signs in that way that is simple, functional, and aligns with the structure of their spoken language. If you have any questions or ideas for future sign language videos email me at alisabeth@musictherapyconnections.org. everyone had a wonderful holiday and ate delicious food. This is a great time to reflect on what I’m thankful for during these past few months here at my internship. Everyday is a blessing and I’m so incredibly grateful for all of the learning experiences that occur each day! That being said, I would love to share with you a few of the things that I am thankful for in my life right now. I’m thankful for a supportive and loving family. I don’t know where I would be in life if it weren’t for the love and support that I get on a daily basis from my family. They are constantly there to encourage me or lift me up when I am down. There have been several times during my internship where I have felt defeated, but my mom and dad always remind me where I need to find the strength to continue and they always bring a smile to my face. they have never once doubted me or my abilities and this has helped immensely during my internship. Thanks family for being so awesome! I’m thankful for fantastic supervisors. I am being completely serious when I say this, but my internship supervisors are amazing people. I’m thankful for them because they have helped me grow as an individual and have helped me gain a significant amount of confidence that I didn’t have before, in every area of my life. They welcome me with open arms and never expect me to be anything else but myself around them. They’re great mentors and people that I look up to and inspire to be one day. I’m so thankful for this internship and for all of the wonderful people that surround me here. Even though we live miles and hours apart, I can always count on them to be there for me. Sending me random texts throughout the week of funny GIFS or even just calling me up/skyping with me makes me feel incredibly special and is a constant reminder that I am loved. They bring a smile to my face every day and I hope that they know just how much they mean to me and how valuable they are in my life. I’m grateful for music therapy. Obviously, I am grateful for music therapy and my soon-to-be degree, but music therapy is such a blessing. Watching the smiles on my client faces as they realize their success is so wonderful and music therapy can help people grow in many different ways. I’m thankful that music therapy is a valuable and effective service to many and helps improve overall quality of life. I’m already thankful for my future co-workers who will help me continue to grow in this field and for their work that they are doing with their clients. I’m so grateful for each learning opportunity. I am so fortunate and privileged to live in a society where I have the opportunity each day to learn by being in school/internship. I have the chance to use what I learned in a constructive and beneficial way for other people. No matter what, each moment in the day is some sort of learning opportunity therefore I am grateful for the bad moments and the awesome moments because I know that they will help me become a kind, empathetic, and mindful person. Well, thank you for reading this post. It’s always a good reminder to reflect on things that you might be grateful for, especially around this time of year. As I progress through my internship, I realize how important it is to have fun with what I am doing because lets face it, music therapy is a fun and an effective profession. It’s something that I have been learning recently and I finally had a break through this week. Yesterday, I had fun working with my clients and students and they all made significant progress towards their goals. I’ve written in previous blog posts about being myself in sessions and growing in my personal life. Yesterday was the first time that I finally felt like I had been my complete self in every single session that I lead. It wasn’t scary; it actually felt natural and I had fun working with my clients! I was better able to assess their needs in the moment because I wasn’t so focused on what I was doing. Also, like previously mentioned, my clients were better able to meet their goals. If I am having fun and not focusing so much on myself, my clients definitely notice and they, in return, enjoy what they are doing which is important so that they can work towards their goals. I think that it’s common to forget to have fun in any profession. Daily life stress, documentation, requirements, and other projects may get in the way and it’s easy to forget why you went into the field in the first place! This can lead to negative feelings, work stress, and a decrease in work production. I’ve noticed that when I have a bad mindset and think too much (aka not be myself), I am miserable and then I don’t want to do anything because everything seems terrible. Dale Carnegie said “people rarely succeed unless they have fun in what they are doing.” This quote speaks volumes to me because I learned this week that when I get out of my head and start to have fun with my clients while working towards their goals, a lot more gets accomplished. My clinical skills were significantly better and the clients were more successful all because I changed my mindset to be more positive and decided to enjoy every little moment. It may be easier to have a negative outlook on life, but everything is much better with a positive outlook. Having a positive mindset and enjoying the time with clients can be so huge and change everything. 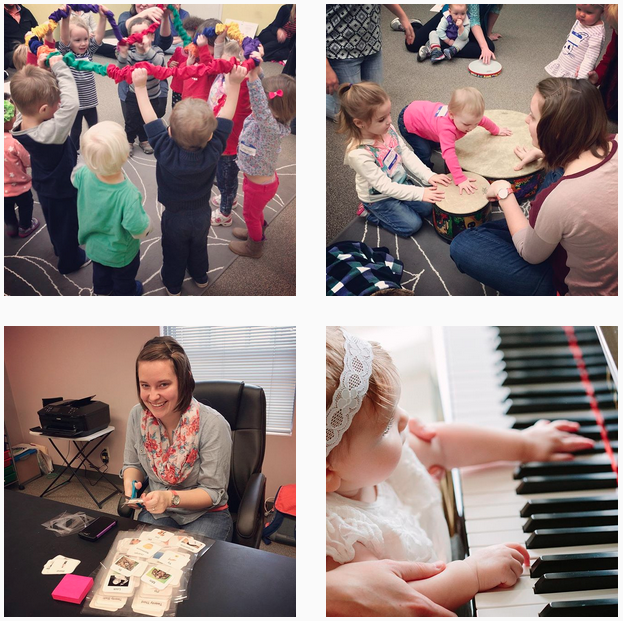 I love music therapy and I love what I do everyday at my internship working with many different clients. Basically, just make sure you are having fun in your profession because life is too short and music therapy is awesome. I’m sure you all have your favorite fall season songs. This fall season mine have tended to use focus words like thank you, you’re welcome, tree, leaves, and of course, Thanksgiving! Those are the signs that you can find in the video this week! I will often teach a sign by choosing a standout word in a given song, learning the simple sign, and teaching it throughout our musical intervention. We will repeat these songs every week on an ongoing basis. By the end of our treatment period most of our clients and students have learned this sign and can use it as a form of communication and self-expression entirely independently! I hope you all enjoy todays video as much as I have! Stay tuned for next week’s video before the holidays! I hope that you all have had a wonderful week. I know I have! This weekend was the American Music Therapy Association National Music Therapy conference and it was a blast. Music Therapy Connections had a booth at this conference which gave me several opportunities to talk with professionals and students, building connections and growing my communication skills. It has been an exciting time and it’s always so interesting to hear other people’s stories and their experiences. Also, I was able to see and talk with many friends from school, which was wonderful because I missed all of them dearly. Besides talking with professional MT-BC’s and other students, I had the opportunity to attend several sessions; at these sessions, music therapists gave presentations about current research, collaboration between music therapy and other professions, and even shared their methods and intervention ideas. It was a great learning experience, especially now that I am completing my internship. I believe that attending conferences is extremely important and essential in the growth of the music therapy profession. As I continue in my education and continue building my skills, I am realizing just how important it is to network with other music therapists and students. I am learning that when you have these relationships and connections, you can discuss ideas for interventions, research, best practice methods, and help in the growth of the profession. I love talking with my friends from school and learning about their experiences in their life as a professional music therapist because I can ask for suggestions and guidance; they may have experience in a different area and I can learn from them. Collaboration, not just with other professions, but with other music therapists and students is important and wonderful. In my personal opinion, if we work together, learn from each other, and support one another, then the field of music therapy will continue to be a strong profession and grow even more. Attending conferences allows us to do just this-grow, work, and learn from each other. School is another excellent place to build relationships. When you are a student, build connections with everyone in the program because you never know what the future holds; you may work with a few peers and they can be excellent resource sources! I am going to spend this week reflecting on my experience at this conference and determine how I can use what I learned in my practice as an intern. I look forward to attending future conferences, especially next year in St. Louis!